On Valentine’s Day, the human world becomes obsessed with their love interests, or lack there of. While the actual date of February 14 might not mean anything to the New England Aquarium’s African penguins, they too spend a lot of time and energy on their relationships. These birds form generally monogamous relationships. Since people love penguins, we thought the public might be inspired by the profiles of some of Boston’s best penguin pairs. So did the Boston Globe! Sunday's paper featured a fantastic article about our breeding penguin pairs. You can also get to know some of the notable penguin pairs in this charming video from the Globe. Take a look! Penguin partnerships were even featured by treehugger.com! Ahh... love is in the water. Because we know many folks (like us!) just can't learn enough about penguins, here's a little more information about those charming couples. You'll notice the Aquarium’s penguins often have unusual names reflecting some aspect of their natural history from the location a breeding site to the Latin genus name for penguins. Closing in on 20 years together are Mosselbaai (pronounced Moss-il-by) and Jutten! Now how many people can claim that? These two laid their first egg together in 1992 and were most likely a couple for a short time before. In penguin years, this probably qualifies as the "golden" or human equivalent 50th anniversary. Penguins in an aquarium setting live much longer than their wild counterparts, and life expectancy for them is in the mid to late 20s. A 20-year pair bonding that lasts more than 60-percent of a creature's average life span qualifies as a golden anniversary in any species book. Like many older couples, Mosselbai and Jutten are more reserved and spend a lot of time in their home territory. The happy pair has successfully raised four chicks. 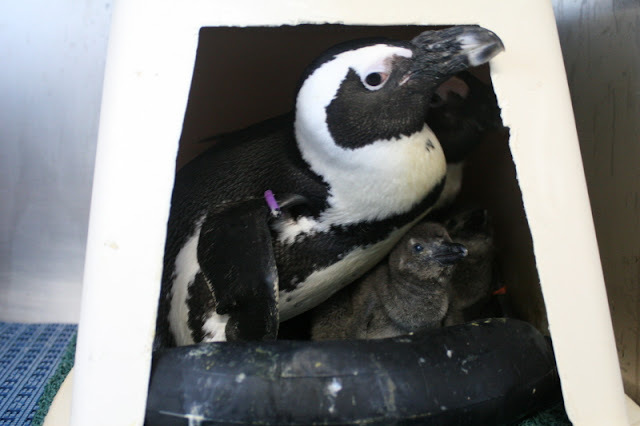 Six chicks in three breeding seasons makes Durban and Harlequin the Aquarium’s most prolific penguin producers! Durban is a 16 year old male, and Harlequin is an 18 year old female. They are always together and make for a very strong couple. In 2006, both unexpectedly became single. They lived in the same neighborhood and according to Aquarium penguin biologist Caitlin Hume, "They just found each other." And what a discovery it has been. If you think raising human children is stressful, a penguin chick grows from cuddly hatchling to a gawky, constantly demanding, full-sized adolescents in about 80 days. In the wild, the resources required to raise a chick are formidable and require the work of two capable adults such as Harlequin and Durban. This is probably one of the major contributing factors for penguin monogamy. For the first 15 days of life, a chick is dependent on one of its parents to sit over the hatchling to maintain its body temperature. In the wild, one of the parents needs to be present until 30 days to protect the chick from predators. As chicks grow, so do their food demands, and both parents commonly swim and hunt more than 20 miles round trip to regurgitate small schooling fish to their crying youngsters, who always want more. At the Aquarium, penguin parents are provided food, but raising chicks is still not easy. As chicks grow to the size of adults, penguins look like exhausted humans raising teenagers and appear to look forward to an empty nest. African penguins normally reach breeding age at four years old. Treasure is a 9 year old female and her breeding partner is Alfred, who might discreetly be called, "a male of a certain age." Treasure was born in 2002, and Alfred was hatched in... ahem... 1975. To save you the math, that makes him 36, which makes him an ancient mariner in the penguin world. But Alfred not only has good genes, but he has very valuable ones for the species. African penguins in the wild are now endangered, and their populations continue to drop dramatically. In the zoo and aquarium world, penguin biologists work together to make sure that their African penguins are genetically diverse. Alfred’s bloodline is not common, so despite his advanced age, he was paired with a young adult female after his former partner had passed away. Ironically and coincidentally, the name "Alfred" does sound like that of a distinguished male from a by-gone era while Treasure has the ring of a vapid gold digger. The names might appear to be a cliché, but their attraction is real and enduring as they have raised three chicks since 2006! Given their birth dates, Treasure and Alfred might be more accurately reclassified as a May/December relationship. Ichaboe (Itch-a-boo) and Spheniscus (Sfen-is-cus) are young adult penguins in a hurry. African penguins become sexually mature at the earliest at 3 years old. Spheniscus is a 4 year old female and Ichaboe is a 5 year old male. They became a bonded pair in early 2010 and right away raised a chick. Like many young lovers in the animal world, they generally can not keep their wings off of each other. Penguin biologist Caitlin Hume noted, "They do a lot of flirting and pair bonding, which is important for young couples as they do not always stay together." Ichaboe is a large male and can be quite aggressive, not only with other penguins but occasionally with Aquarium staff who regretfully have the bite marks to prove it. 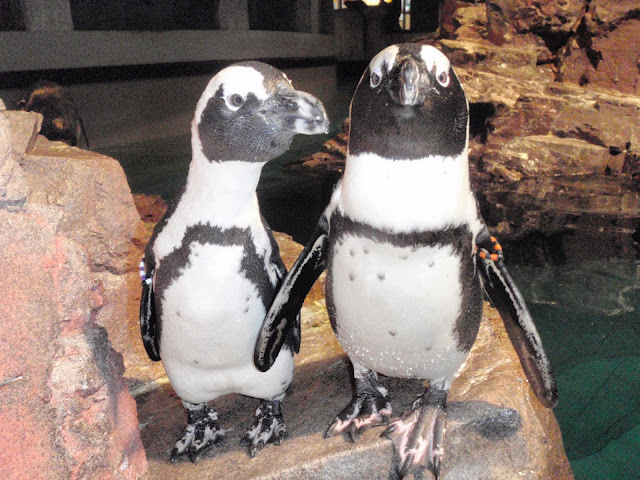 After courtship and defending their territory on one of the Aquarium’s four penguin islands, Sfeniscus and Ichaboe honeymooned in the penguin breeding rooms in the basement of the Aquarium last summer. 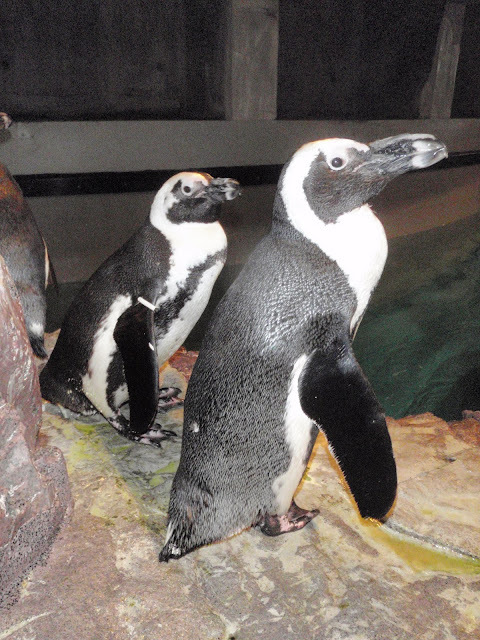 They soon laid eggs and contributed to the Aquarium’s record penguin baby boom of 11 chicks in 2010. Penguins have the same problem as people – how do you know if he or she might be interested in you? It starts with, are they hanging out a lot and are they nice to you. Penguins are territorial. At the Aquarium, individuals and couples have their preferred perches on the islands. If you wander into someone else's space, and they don't chase you away, that is a positive start. If your prospect, turns its head to the side and then puffs up its cheeks, that is a slight signal. If this escalates to head shaking, they are definitely interested. A little vocalization might follow, and it could be capped with the African penguin's signature donkey bray. That noise is how they also earned the name "jackass penguins.". If this behavior is done mutually and repeatedly, biologists call it an "ecstatic display." Now moving beyond flirting to dating, tapping each other's bills and much mutual grooming and obsessive preening are the undeniable behaviors of penguins in love. The movie "March of the Penguins," which documented the unbelievable fidelity of emperor penguin pairs, inspired a nearly mythic but slightly inaccurate sense of how monogamous penguins are. Monogamy varies among penguin species as some are monogamous for a single season while others mate for life. The Aquarium’s African penguins prefer long term relationships, but the bottom line is that penguins are like people. Most are coupled for long periods of time. Some of those bonds loyally last a lifetime. Most engage in flirting outside of the relationship from time to time. Some mate with a penguin outside of the bonded pair but still remain in their primary relationship. This is not an uncommon behavior in the bird world. Some relationships break up, if there is a lack of breeding success or failures to defend territory or forage for food. Penguins are not exceptional in the bird world as monogamy is the norm among most avian species, but humans are exceptional among mammals as only a small percentage have both parents committed to raising their young. Many penguin couples at the New England Aquarium are the product of well-intentioned but manipulative, matchmaking by Aquarium biologists. African penguins are an endangered species, and their populations continue to drop dramatically. The African penguin population in zoos and aquariums is a potential reservoir of birds, if there ever was a calamity in the wild. Maintaining the genetic diversity of such a relatively small and closed population is crucial and challenging. Once every two years, managers of penguin exhibits from throughout North America gather to review the genealogy of new adult penguins and decide on pairings that will maintain a diverse gene pool. Some animals might be moved between institutions. Some unproductive couples might be broken up and re-paired. It sounds cruel, but it is unusually effective. Penguins are very social animals both as couples and colony nesters. The desire to pair up is nearly imperative. A potential new couple is removed from the exhibit and placed in separate but close quarters. As mutual interest is displayed, the biologists create more access. Bonding is sometime instantaneous, and other times takes repeated short term exclusive exposures over months. Most of the time, it is successful. 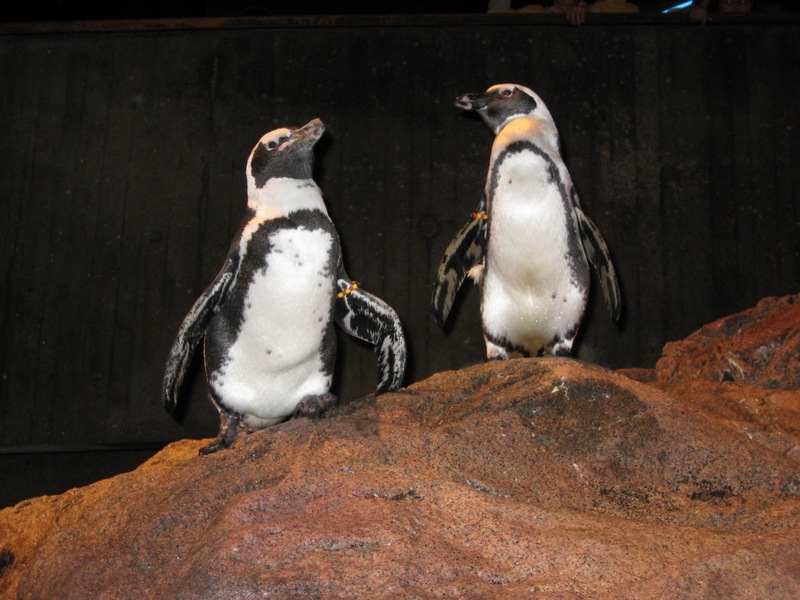 Come by the Aquarium with your sweetheart and see if you can spot these notable pairs in the Penguin Exhibit! Check out the Visit Planning resources available on our website, like public transportation tips and nearby parking options. "Tron: Legacy" now playing at the Aquarium! Sunday is Couple’s Day at the Aquarium!